Each Year St Pius X Church in Middletown, CT in collaboration with the Middletown/Clinton Prenatal/Medical Departments offer a Thanksgiving feast for families in need. Hurricane Irene, the unusual snow storm in October and the economy have impacted the amount of donations typically made to our state’s food banks and other charitable organizations and all have felt the crunch. Although we were concerned about how this might affect the Annual Thanksgiving Meal Support for our families, the generosity of parishioners from St Pius Church and our local community came through. 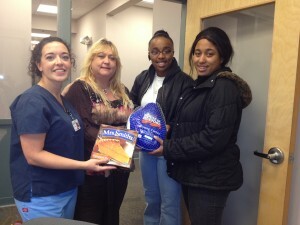 This year we were able to offer full Thanksgiving meals to 16 CHC families throughout Middlesex County. Food items for each family include: turkeys, potatoes, vegetables, gravy, pies and other staple food items. We were able to offer exactly what one would expect to enjoy at a hearty Thanksgiving meal. Meals were distributed on the Tuesday of Thanksgiving week in our Clinton office and Wednesday in the Middletown office. Peg from St Pius coordinates efforts each year’s efforts with CHC staff. A big round of applause this year to Holly Naud and Raquel Espinoza from CHC and Peg for collaborating to make this year’s Thanksgiving Meal Support for Families a success. We look forward to continuing this endeavor and to helping families in the year’s to come.